Blue Jays fans were in awe, making "ooh" and "ahh" sounds, as a Bryce Harper shot went well over 400 feet into a Blackberry banner above the seats in Toronto. Harper's solo shot was a massive bomb, causing the stadium to shut down to a stunned silence. 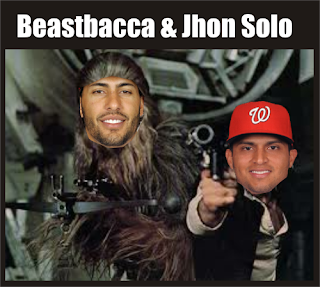 While the Nationals won the game 4-2, that Harper bomb in the 2nd inning was all you needed to know. Espinosa hit a homer to center in the 4th to give the Nattys a 3-0 lead, and later after a Bautista HR cut the lead to 3-2, Jhon Solo used the force to will a ball out of the park for his first major league home run. As he entered the dugout, the whole team just sat there. Silent Treatment. I'm pretty sure every Sunday Chien-Ming Wang is down at Eastern Market because he lovvvvvvessss Jams. (I'll work on that joke). He escaped a few but it was only a matter of time before the Jays struck. Wang walked Bautista twice in the game with nobody on and then in the 5th with 1st base open he threw one right over the plate. Bautista hit the ball like it was Booker T's face right over the wall. I throw my hands up in the air sometimes. Wang only lasted 5 innings, then Detwiler came in. I don't really like this combo thing and I'm not sure what to make of the 5th starters slot. Detwiler, Wang, Lannan, Trade? Clippard picked up his 9th save with 2 K's. Hello Davy, why was he not closing weeks ago!? Also of note, Zimmerman hit another ZIDP, his 9th already on the season. Zimm is struggggglin. And Bryce Harper bunted again, this time he got on base in the 8th inning leading off. Then as Harper does, he got picked off on the base. Nats go for the sweep tomorrow at 12:37pm EXACT TIME!